Growing up, my parents used to play the cast album from "You Don't Have to be Jewish" quite often. One of the short plays featured a Jewish mother crying out "Oh, the agony! Oh, the ecstasy!" When asked what was wrong, she confessed the her only daughter had eloped (the agony), but it was with a nice, young doctor (the ecstasy). My own agony/ecstasy moment is happening now. Oh, the agony… the next installment of the Blood Brothers' Bedlam Nightmares series opens tonight and I'm out of town for the run. Oh, the ecstasy… one of the Blood Brothers has smuggled me a copy of the script. I can't review the production, since I won't be able to see it. And I don't want to give out any spoilers. So I'll just say this. The show is well-written. It is bloody (oh, how I wish I could see what Stephanie Cox-Williams has planned for the special effects). And it is full of the stuff that will give you nightmares, including the return of Grandma Blood. I can't wait to hear the buzz about the show when I get back. So while I can't tell you much about this weekend's show, I thought I'd give you some information about this new Blood Brothers series and review the previous show in the series - "The Blood Brothers Present… Bedlam Nightmares, Part One: Strapped In." Part One found the Blood Brothers (Pete Boisvert and Patrick Shearer) inmates in Doctor Queen's (Kristen Vaughan) asylum. Scheduled to be executed in October, Doctor Queen plans to spend the rest of the year figuring out what makes the Blood Brothers tick. Helpless for the first time in their lives, the Blood Brothers find it hard to adapt to their new surroundings and to Doctor Queen's insistence that they no longer directly address the audience (those familiar with the Blood Brothers know that Shearer's character serves as a sort of bloodthirsty host/emcee - think of a psychopathic Rod Serling or a cross between the Marquis de Sade and Mr. Roarke). Bereft of their normal source material, the Blood Brothers incorporate the stories of the other inmates into the narrative. These include a new inmate and his cellmate who promises to watch over him during his first night, a woman obsessed with being forgiven by the love of her life for a betrayal, and the survivor of a yoga retreat that went horribly awry. Also included in the mix is Nat Cassidy singing the first section of a song cycle that will span the Bedlam Nightmare series about a nascent (and pre-pubescent) serial killer. As usual, the evening features some amazing writing from Blood Brother stalwarts Nat Cassidy and Mac Rogers, as well as some strong directing from Pete Boisvert, Patrick Shearer and Stephanie Cox-Williams. Cox-Williams, often referred to as the Tom Savini of Off-Off-Broadway does her stomach-churning best with the special effects for this show. Just an example of what she can do - in one of the short plays, Mac Rogers' creepy "Breakfast at Six," featuring the new inmate (Collin McConnell) and his cellmate (Bob Laine), one of the characters rips off his own eyelids (one of which is later eaten by Boisvert's Blood Brother). Nasty, horrifying, and so incredibly well done. The surprise of the evening was Cassidy's "Into the Life of Things," about the yoga retreat. A young couple (Matthew Trumbull and Stephanie Willing) falls under the spell of a charismatic leader (August Schulenberg). Throw in some food deprivation, a touch of psychic ability, and a possible love triangle and the retreat takes a homicidal turn. This was a strong, well-structured story with an unexpected paranormal twist, and it worked nicely into the main Blood Brothers/asylum story. This was longer than the typical short play included in a Blood Brothers show, which provided a nice balance to Rogers' and Cassidy's other short pieces. I'm happy to see that some of the evening's pieces will be continued in the current episode of Bedlam Nightmares. I can't wait to see where this series goes. 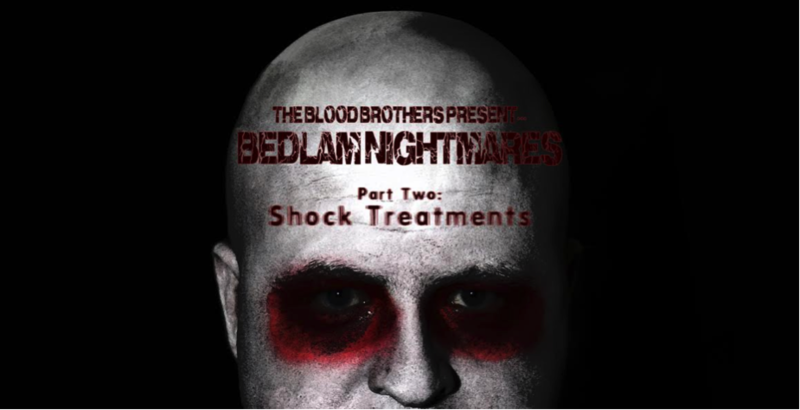 The Blood Brothers present… Bedlam Nightmares, Part Two: Shock Treatments opened tonight at The Brick Theatre, 575 Metropolitan Ave. in Brooklyn. It runs through Saturday, May 10th. For more information, visit www.bricktheatre.com.